The Fifield Old Town Hall is listed on the National Register of Historic Places, where it is cited as "one of the few remaining buildings of its kind." The State Historical Society remarks that it is a "very impressive landmark." The Fifield Old Town Hall is in itself a very valuable artifact. 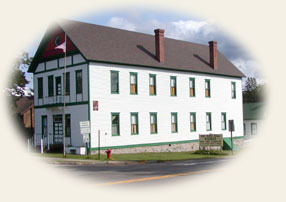 The Old Town Hall Museum is maintained and operated by the Price County Historical Society. The Old Town Hall Museum was a government building from 1894 until 1967. It was built in 1894 to replace the original building constructed in 1882. That building and many others were lost in the fire of 1893, which destroyed the entire Fifield business district. Through the years, day-to-day government business was conducted in the lower floor offices. Town meetings were held upstairs in the large hall. The upstairs was also the site of countless dances, talent shows, graduations, school programs, fancy balls, lodge meetings and appearances by visiting speakers. Beginning on the lower floor, the former clerk's office displays logging tools, camp artifacts, railroad memorabilia, and the Round Lake Logging Dam Model. A Victorian period living room, kitchen, and bedroom occupy the old jail area. A changing exhibit room provides various aspects of county history. A gift shop offering books of local and northern Wisconsin history is also located in the former treasurer's office. The old ticket office still stands sentinel to the wide stairway leading to the upstairs social hall, also known as "The Opera House." A stage remains an integral part of the interior, and a touch of early pioneer elegance is evident in the wainscoting and a delicate stencil, which has been restored on the walls. Exhibits in the great hall include farm implements, artifacts of early transportation, clothing, CCC Camps, military memorabilia, and the Old Price County Courthouse furniture. The stage offers a glimpse into early county history, with the theme usually changing periodically. The organization operating the Price County Historical Society was organized in 1959. The society took on its first substantial project in 1967 when it acquired the Fifield Old Town Hall from the town of Fifield. Restoration of the building began in 1969. In 1976, the doors were opened to the public for the summer season. Today, the society maintains and develops the museum with support from Price County, the town of Fifield, private donations, grants, membership dues and volunteer help.